7.1. 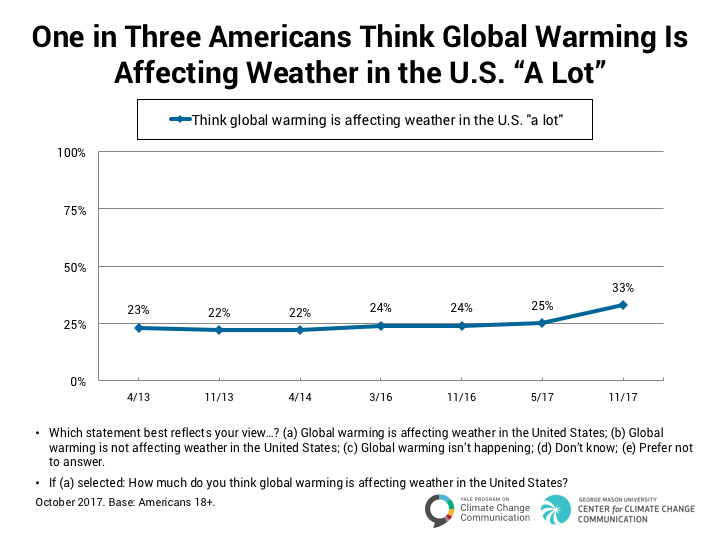 Nearly two in three Americans think global warming is affecting weather in the United States. As reported in the previous section, about two in three Americans (65%) think global warming is a severe weather issue. 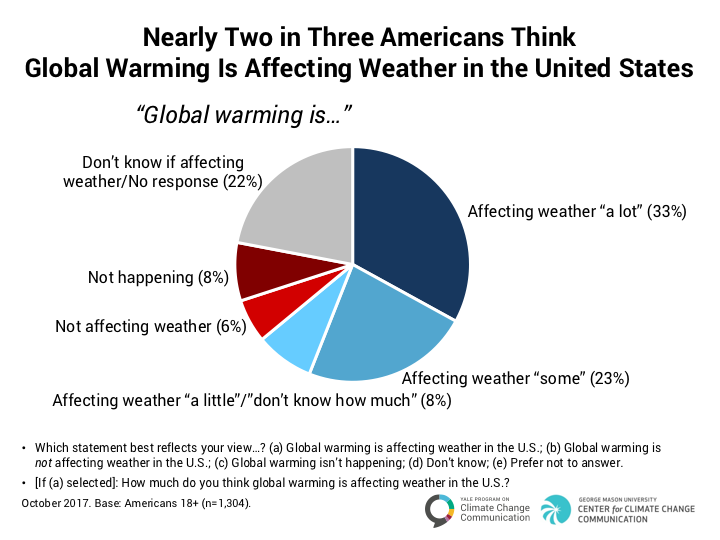 Similarly, 64% of Americans think global warming is affecting weather in the United States, including more than half (56%) who either think global warming is affecting U.S. weather “a lot” (33%) or “some (23%). The percentage of Americans who think global warming is affecting weather in the United States has increased since our last survey in May 2017. The percentage who say global warming is affecting the weather “a lot” increased by eight percentage points since May, and is at its highest level since we first asked the question in 2013. 7.2. 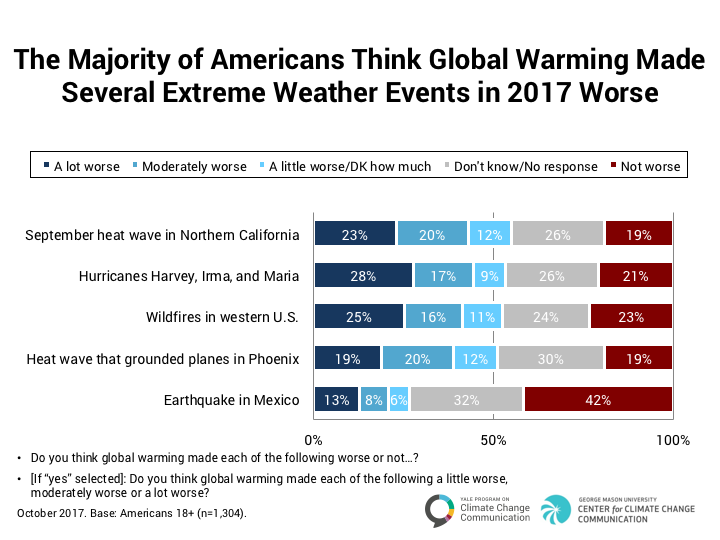 A majority of Americans think global warming made several extreme events in 2017 worse. A majority of Americans think global warming made several extreme weather events in 2017 worse, including the heat wave in northern California in September (55%; 23% “a lot” worse), hurricanes Harvey, Irma, and Maria (54%; 28% “a lot”), the summer and fall wildfires in the western U.S. (52%; 25% “a lot”), and the heat wave that grounded planes in Phoenix, Arizona in June (51%; 19% “a lot”). About one in four (27%) think, incorrectly, that global warming made the September earthquake in Mexico City worse. 7.3. Most Americans are interested in learning about how global warming is or is not affecting extreme weather events. 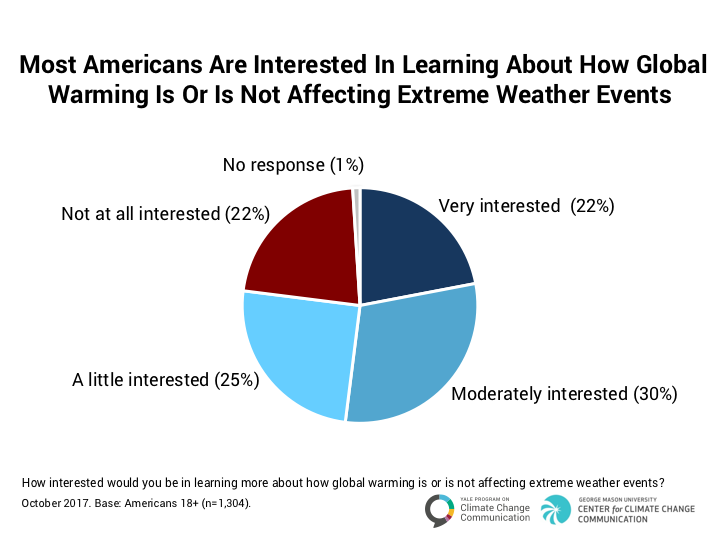 More than three in four Americans (78%) are either “very” interested (22%), “moderately” interested (30%), or “a little” interested (25%) in learning more about how global warming is or is not affecting extreme weather events. About one in five (22%) are not interested.